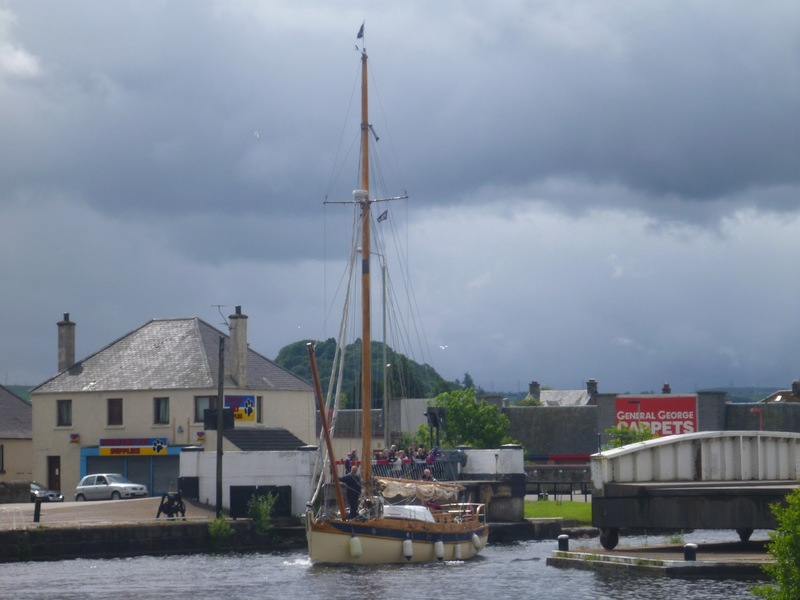 From the moment we called up the wonderfully sounding Clacknaharry Sealock at the Inverness end of the Caledonian Canal (the Caley) we knew we were in for a treat. The welcome we got was warm and helpful, full of advice and it turned out so were all the lock keepers we met further on, almost without exception. They do a difficult job juggling their locks, bridge openings, maintenance work and even a short breakdown at one point with the needs of yachts in transit (and often in a hurry), inexperienced boaters in hire cruisers and a small amount of commercial traffic. Several road bridges are closed to canal traffic for an hour or forty minutes during what passes for the morning rush hour and at either end of the canal Network Rail control the opening of the rail swing bridges that cross the canal but it never seemed like an inconvenience to us. We soon found that the keepers are extremely organised timing a passage through the locks with the bridge openings so that an early morning group of boats could pass down and the bridge would then open allowing both the flotilla that had just come down to pass through and the new bunch to enter the locks. The locking up would then happen over the closure period. 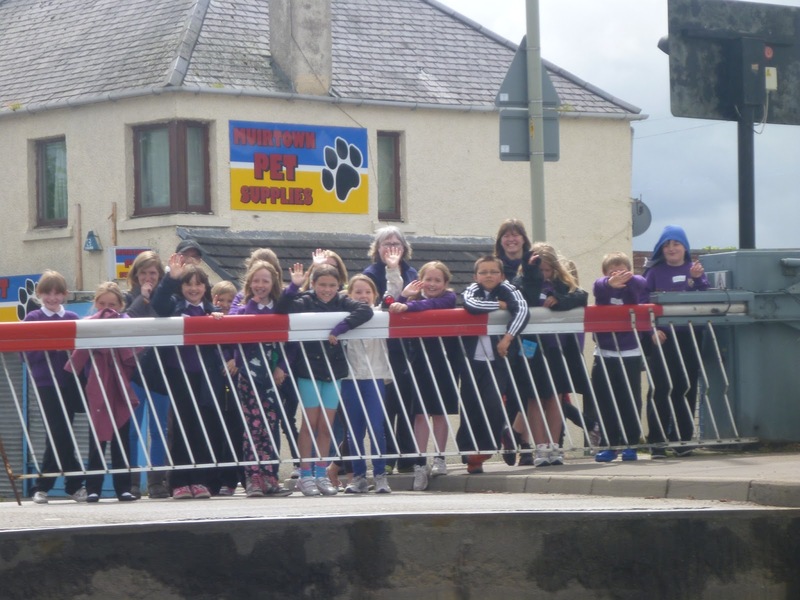 They also managed to fit their lunch breaks in with little inconvenience to their customers and at Fort Augustus the team of keepers drank their morning tea whilst the locks were filling. They chatted cheerily over the radio to the bridges and locks ahead informing them of what traffic was heading their way. Yachts and larger cruisers required the bridges to open whilst the smaller hire boats could pass freely under them. We’d call as we approached only to be told we were expected and the lock was ready for us, enter on the starboard side and they’d take our lines. Occasionally we’d have to wait for traffic coming in the opposite direction to complete a lock. Usually four or so boats at a time fitted into a lock, sometimes a mix of cruisers and yachts, sometimes all yachts. Temptress shared one lock with the Jacobite Highlander, a large and very purple, passenger carrying boat that does tours from the Inverness area along the canal to Loch Ness. Most of the single locks were run by one keeper who ensured the front boat on one side were secure before briskly moving round to the other bank across the gate and helping the two boats there get sorted then returning to secure the final boat and close the gates. 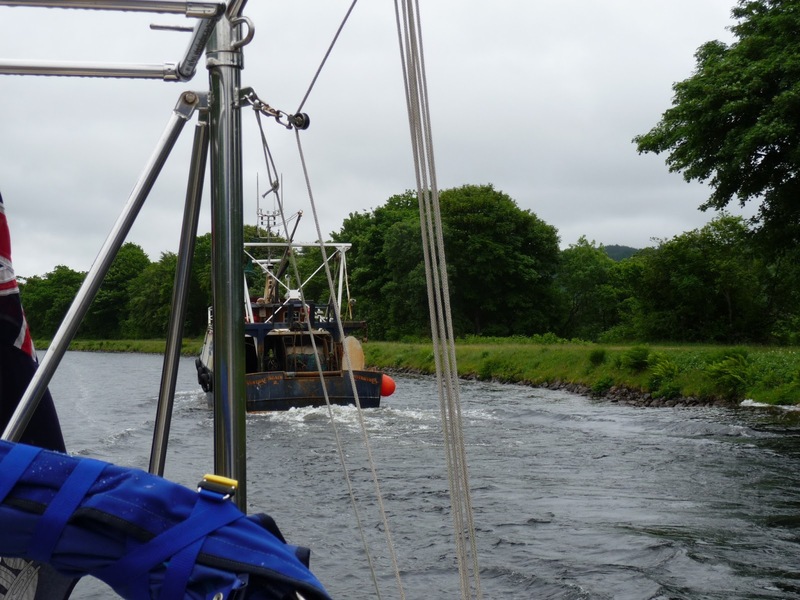 The flights at Muir Town, Fort Augustus and the enormous Neptunes Staircase at Corpach were operated by a team of keepers. 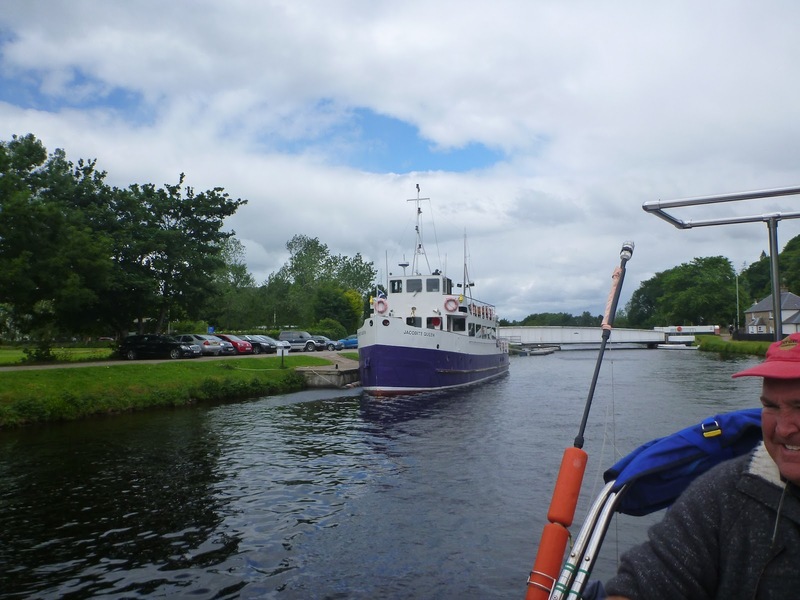 For the flights up at Muir Town and Fort Augustus once up the first lock Susie stepped ashore with a line and controlled the bow from the lockside. Smaller boats were hauled through from chamber to chamber but Temptress’ size and weight meant the engine was utilised to move her forward each time, the crew using the bowline simply to stop her on reaching the front of the next lock. A lock keeper would take the sternline from Kevin and loop it round a hook for him so he could control it from the boat. As the boat rose we’d shorten the lines to prevent her drifting off sideways and with the rush of water into the lock let the line in or out to ensure she roughly stayed parallel to the lock wall. In between the locks were “bottomless” lochs and man-made canal sections all very pretty with fantastic scenery when the cloud lifted enough to see the mountain tops. Most hillsides were clad in Forestry Commission fir trees, monoculture at its most efficient but not so attractive especially when there were big gashes where felling had taken place. We also came across a few large logs floating in the canal below Loch Ness, a potential hazard to navigation. The other plant that seemed to take up a lot of hillside is the rhododendron and later down by the river side near Fort William we came across a large area of Japanese Knot Weed, both plants introduced in Victorian times and both a threat to native species, pretty but potentially deadly. A cob fights off his reflection! 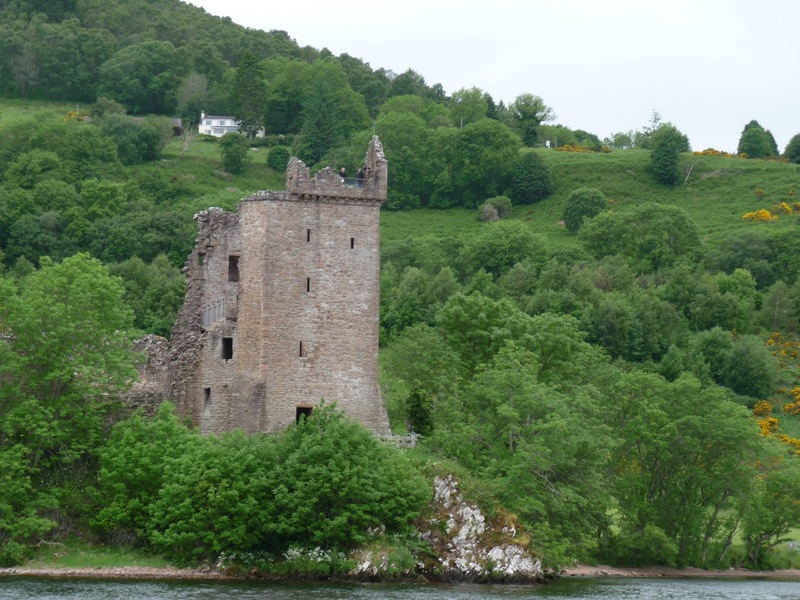 We were beguiled by Loch Ness and dropped the hook in a quiet bay near Castle Urquhart for lunch. Most days we managed ten or so miles, one day only four! 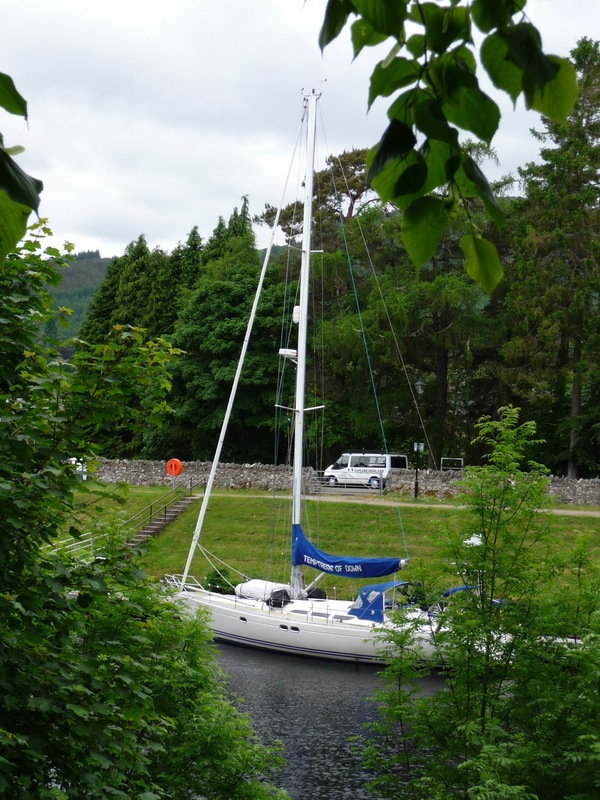 Fort Augustus proved to be very touristy with Nessy, trip boats, rib rides and gift shops but we met a lovely lady working as a glassblower and enjoyed watching the tourists taking pictures of us moored alongside the canal below the road bridge. At Loch Oich we took a walk on the “historic Bridge of Oich” and were a little alarmed by signs that warned the maximum number of pedestrians on this ancient suspension bridge over the river was fifty, fortunately there was only one other person around that evening. The bridge itself goes nowhere nowadays; there is a gate on the far bank with no access for the public to the garden and fields beyond. 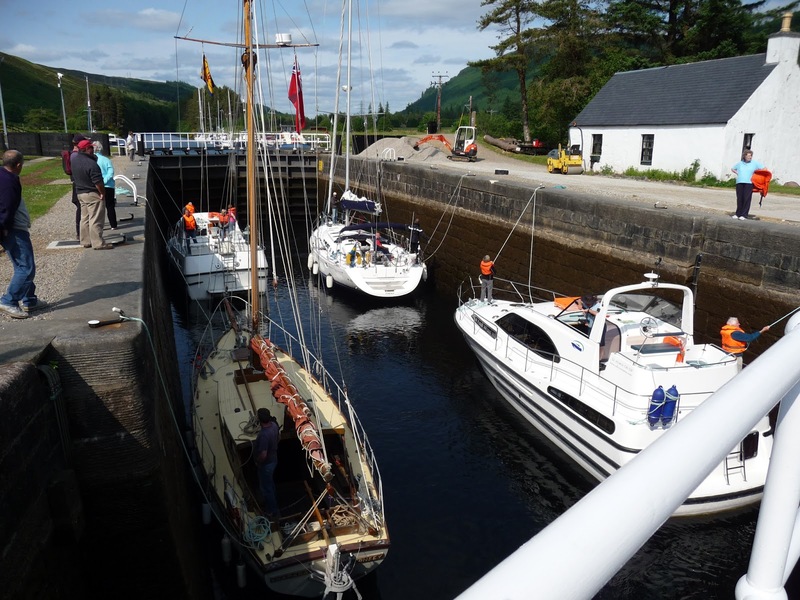 Further on at Laggan Locks, Rona’s owner Jim joined us for supper (we had planned to go to the pub but it was closed on Wednesdays and possibly Tuesdays too), the three of us had a pleasant evening over a few glasses of wine chatting about sailing. 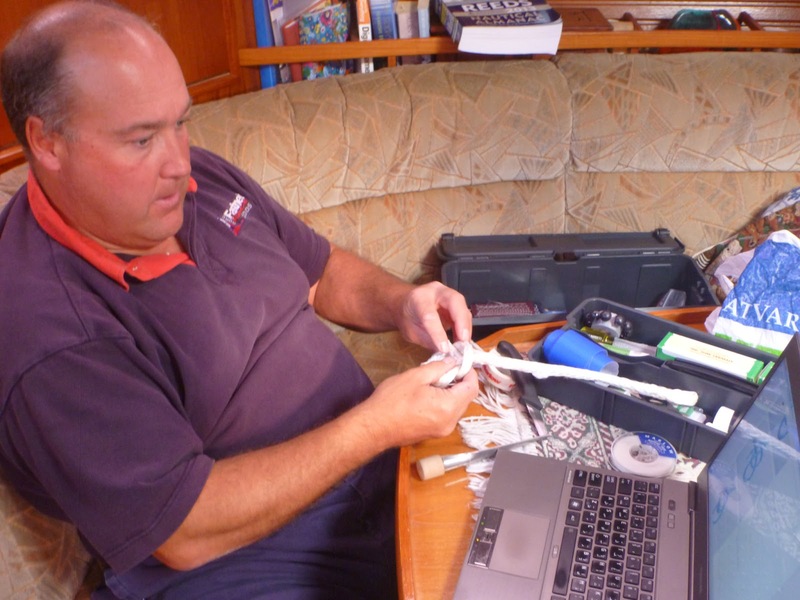 Jim, a retired biologist from Edinburgh, lives aboard Rona a Rival 34 (the same model of boat as the one Susie took her Day Skipper exam in years ago) and spent last winter in Lewis. He now plans to wander through the Western Isles for the summer. Rona has oil lamps and a solid fuel stove for heating plus a paraffin cooker, cosy and practical. No sign of Nessie except a very purple plastic model on the shores of the eponymous loch but there was (probably) a Peregrine Falcon preening itself at the top of a dead tree by Loch Lochy (no idea what else would be that big and that colour just there), many swallows darting here and there and some anxious swifts (we’d moored in front of their nest in the quayside wall whilst waiting for the locks back at Muirtown) plus a few chaffinches in the villages and everywhere oystercatchers with their distinctive call. 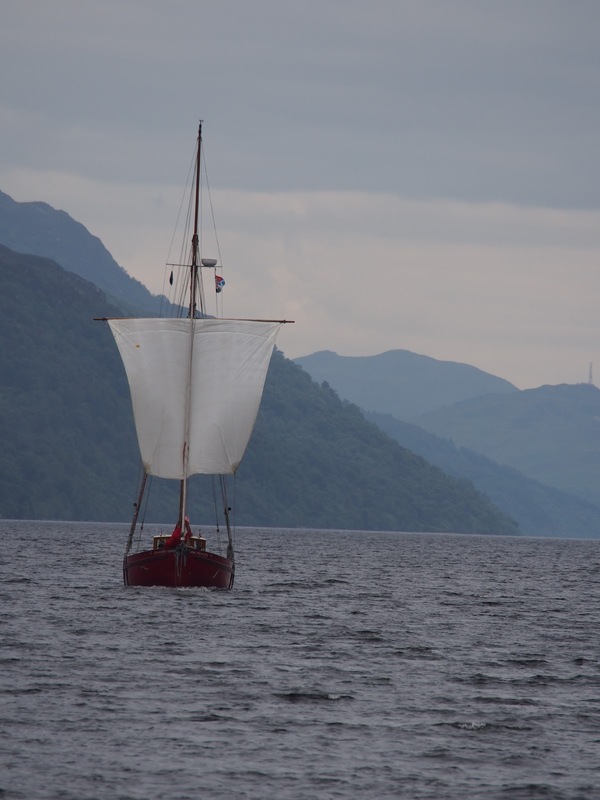 Meanwhile our boat spotting tally almost had a Viking Longship added to it but the boat in question turned out to be a red hulled gaffer” Bonify” flying a square sail from a yard as they headed north east up Loch Ness towards us! 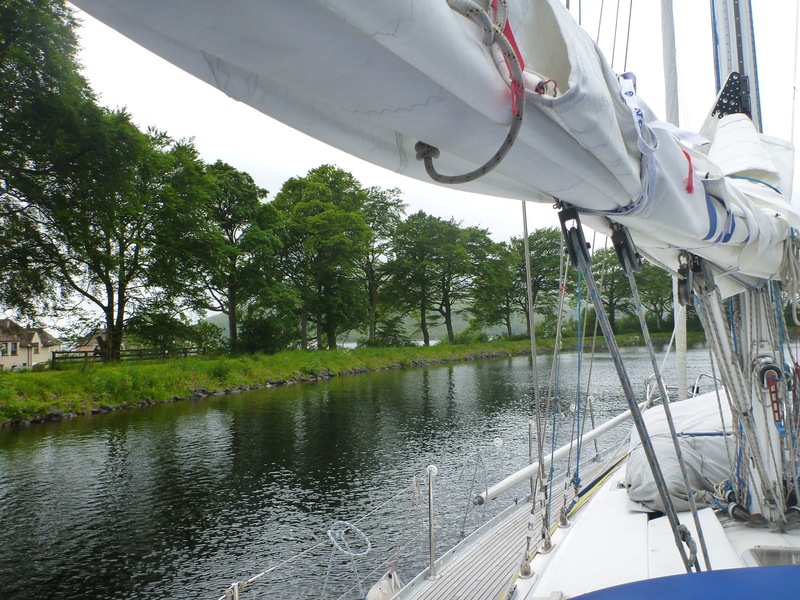 We met quite a lot of Old Gaffers transiting in the opposite direction to ourselves at intervals in the lochs and canalised sections (our headwind was conveniently easy downwind sailing for them). This year being the 50th anniversary of the Old Gaffers Association they were celebrating by sailing around Great Britain. It added interest to our days as we photographed and in some cases even got to meet the crew of these lovely old boats. Peggy for example was an extremely low freeboard, wide bellied wooden boat with a royal blue hull,a relatively tiny gaffer for this length of voyage. 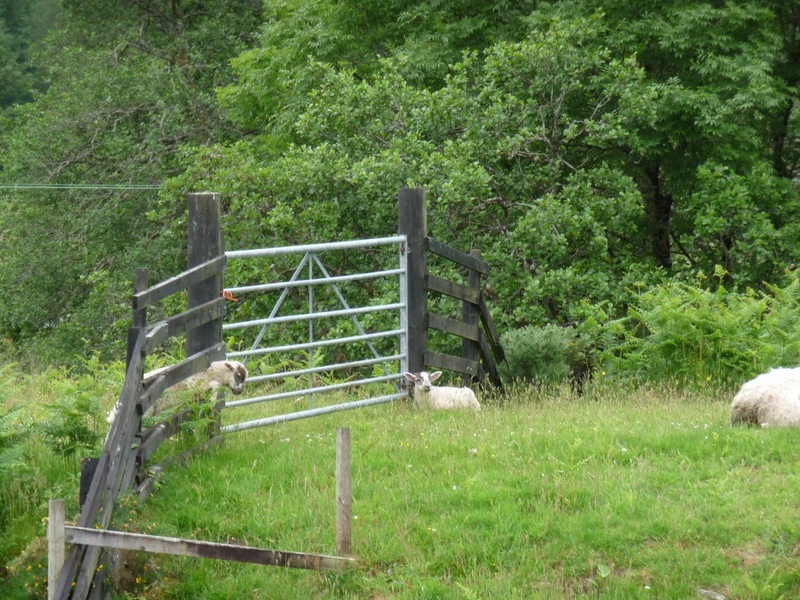 We met her one evening above Laggan Lock, her owner more than happy to retell her history. 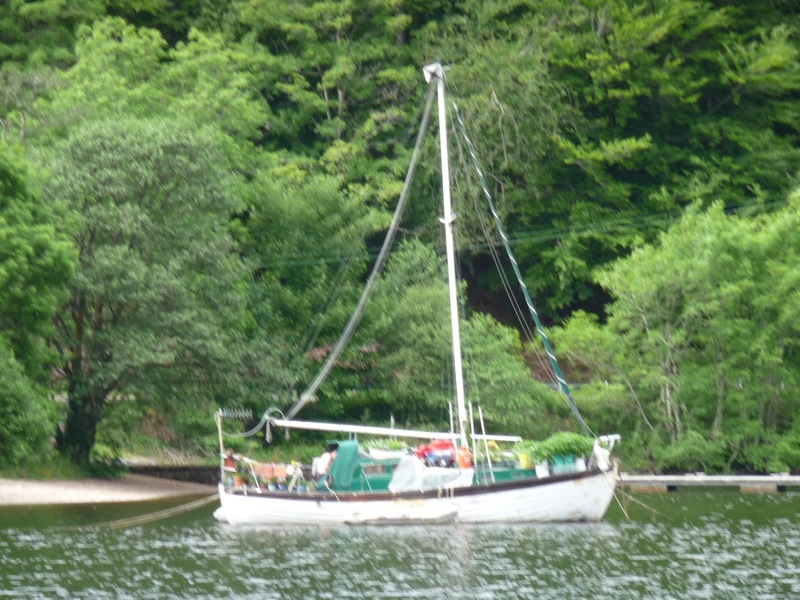 She had been a Morecombe Bay Prawner (hence her deck being only inches above the water to make it easier to haul in nets) prior to being converted into a cruising boat. Mostly Peggy nowadays confined her sailing to the rivers of Suffolk but her owners thought the challenge of the OGA anniversary Round Britain cruise too good an opportunity to miss so here she was and though “she took a bit of water over the side” when they met a gale in the Bristol Channel on the passage to Milford Haven they were mostly enjoying sailing to new places. The grey, low clouds that had hung around every mountain top turned to rain and more rain as we approached the west coast towards the end of the week. 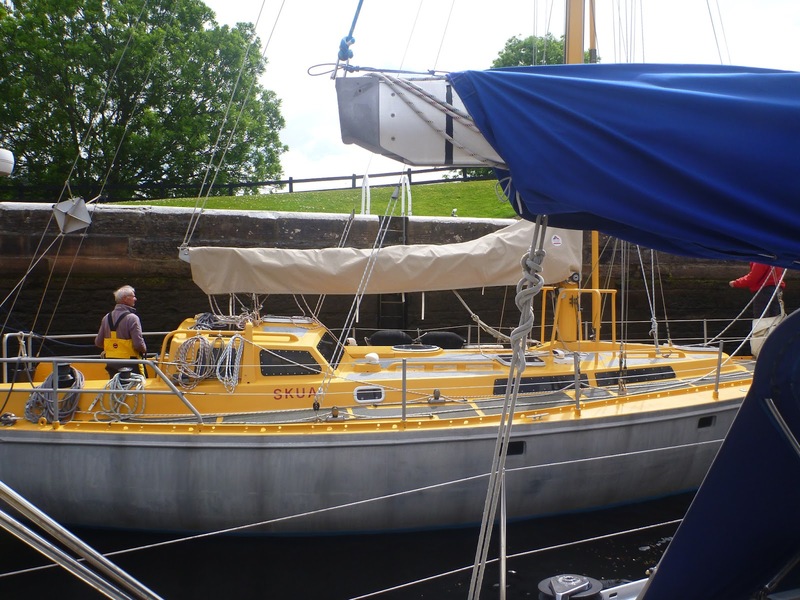 Temptress found a snug berth at the top of the last big flight of locks down to the sea for a couple of nights with a potential view, if the cloud should clear, of Ben Nevis off to the west. 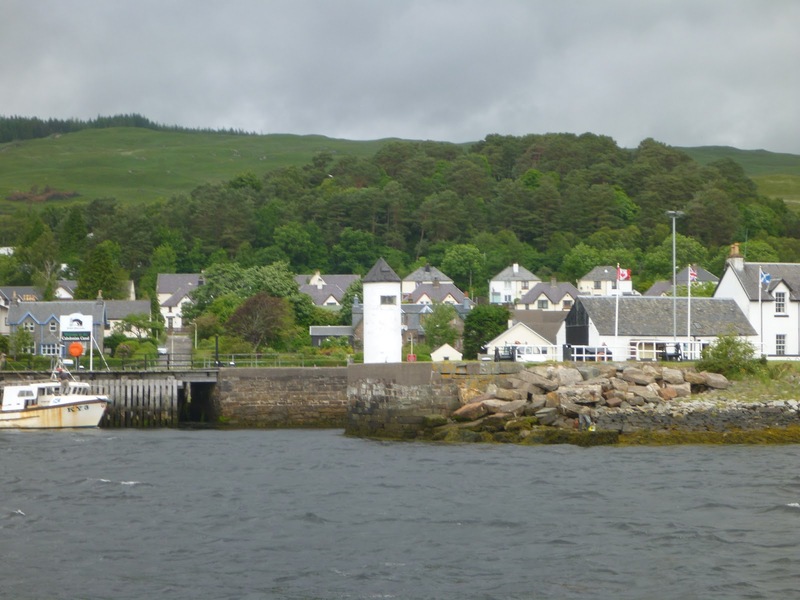 A brief dry period enabled us to do a little geocaching and some exploring of the nearby villages (Banavie, Corpach & Caol) and the river estuary by bicycle late Thursday afternoon. We found the towpaths and road all crossed the railway several times so ” stopped looked and listened” more times than we could eventually count, apologies to the Banavie Signal box staff who must have seen us at least three times that afternoon making our way over the pedestrian level crossings either side of the canal bridge just there! On Friday morning we braved the rain for another cycle expedition to the sole shop (fifteen minutes away in Corpach) for provisions. Couldn’t buy beer as it was only 09:30am and there was a fairly limited choice of meat and veg on offer in the cramped co-op but we got a big Scottish chicken to poach in the thermal cooker later in the week and steak for supper on Saturday. The locals are by and large very friendly and customer service in this part of the world is wonderful; we needed some gas, either refills for one or more of our camping gaz cylinders or a swap of two of them for a single 7.5kg Calor Gas one. “Keep the Camping Gaz cylinders, I can’t refund you what they are worth (£50 each for a new one) but you’ll be able to sell them somewhere on your travels.” the owner of a Fort William camp site advised, “I’ll deliver you a big cylinder later this morning if you can give me your credit card details now” Shortly after 11am in the heaviest rain of the day he turned up as promised to deliver the cylinder and chat about boats! 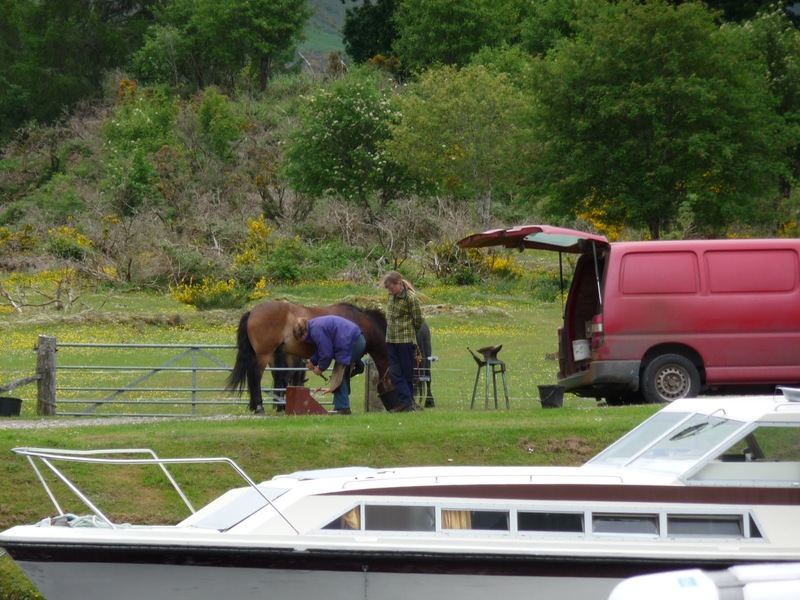 Basically if you need anything ask a lock keeper (that’s how we’d discovered the campsite supplied gas), except for the opening hours of the Eagle Barge floating pub at Laggan which seems to be closed on Tuesdays and Wednesdays but even the lock keeper wasn’t certain when or why! A wet Friday afternoon was spent looking over charts and Kevin’s copy of the classic guide to exploring this part of the world “The Scottish Islands” by Hamish Haswell-Smith, deciding where to head next but without coming to any real decision. We also wondered if the new AIS and or our VHF aerial had an intermittent fault but couldn’t identify what except that the AIS box persisted in a red light. Our Dutch neighbour had our transmission on his chart plotter but we weren’t receiving anything not even VHF traffic from further down the locks or the coast guard. 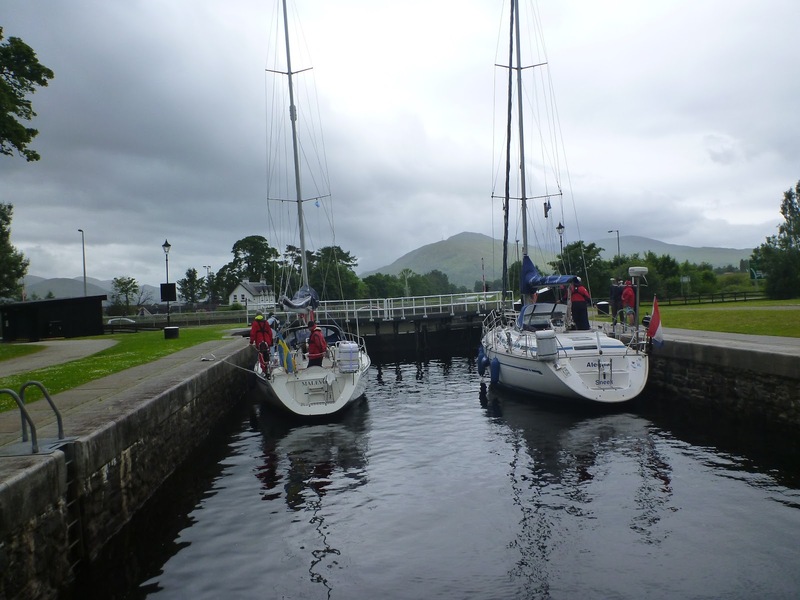 It would have to wait until Monday to consult the supplier we thought but in fact once we’d cleared the canal and headed into Lock Linnhe on Saturday afternoon everything was working normally, it must have just been our location. Going down (the canal summit was at Laggan) was much the same as going up had been, the lock keepers caught our tossed line, passed it round an iron swivelling hook set in the dusky pink granite stonework then handed it back down. We both stayed on board to let the lines out fore and aft as the water level sunk, though we were thrown into a bit of confusion late Saturday morning when we realised the remaining slot in the top lock of the Neptune Staircase was portside to, meaning the crew had to rush about swapping fenders and lines across to the other side of the boat in the few short metres from our berth to the lock entrance. This last stretch of the Caledonian is the most strenuous, first the Neptune Staircase – 8 big locks down in succession, the bottom gate of one forming the top gate of the next, hence stairs. No warm up to this exercise just straight off your mooring and straight into it, throwing lines, catching lines, hauling lines, snubbing then easing lines. It was raining further down the valley, the low level cloud would reach us before we completed the flight so oilies were made ready. The journey down started soon after 11am and took almost two hours. We, in common with the rest of the boats, had failed to actually count the number of gates or chambers marked on the chart and, as you can’t see the bottom from the top, it was something of a surprise after lock six to realise there were still two more to go! By the end arms and shoulders ache, fingers were wet and sore from the lines whilst we were very damp from the drizzling rain, grateful for our scruffy yellow jackets and trousers. 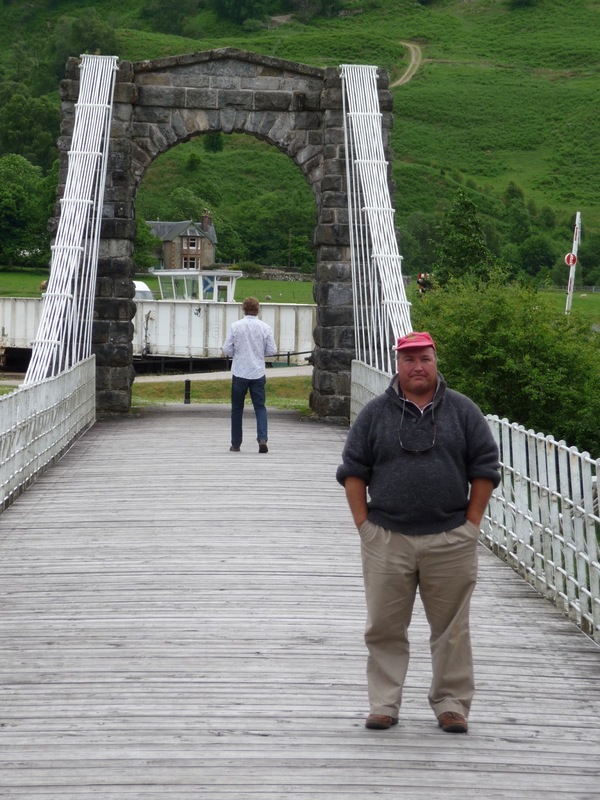 The final road and rail swing bridges opened and Temptress could glimpse the sea once more off to the left through the trees lining the last stretch of canal…. 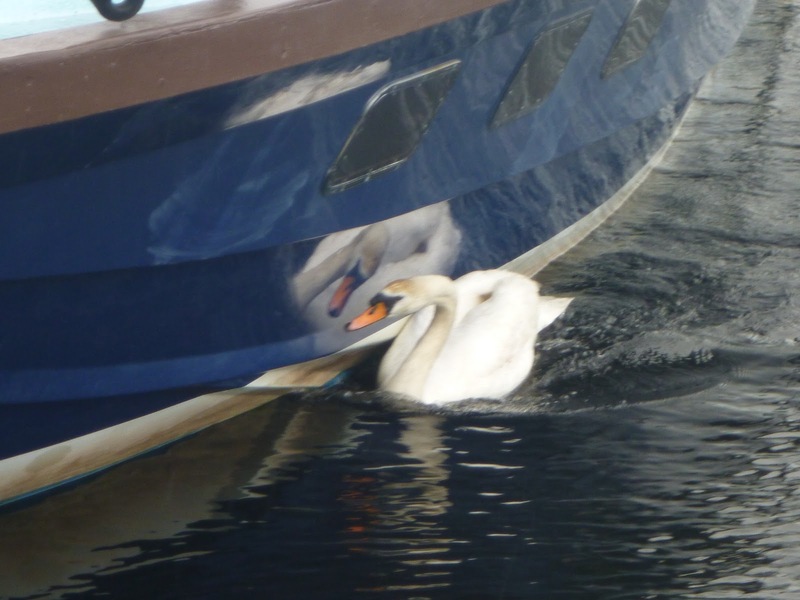 There was still another flight of two locks as well as the sealock to negotiate.